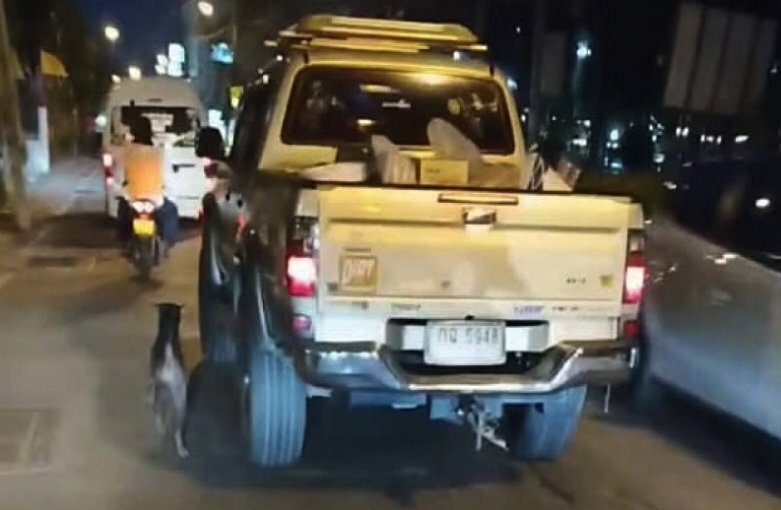 Thousands of dog loving Thais were sharing a video of a dog chasing after a pick-up in Pattaya after it was apparently dumped by its owners. It was posted by "JP Kat" who stated that they had caught up with the pick-up to tell them their dog was chasing them but a woman who wound down the window was not interested. One of the women on the motorcycle in the video suggests that the dog was left when the owners moved house. Dog lovers shared the story in an effort to track down the pick-up. The registration was visible. JP Kat said it was disgraceful that they just dumped their dog for others to take care of. She would have looked after it had they known. The incident happened in the Khao Talo area of Pattaya. Daily News failed to get in contact with the poster for any update. Disgusting people, poor dog is better off away from such low lifes. Heartbreaking. The heartlessness of the people who can just drive off and ignore their dog, being blind to his efforts to catch up, a dog who worships his family, is mind boggling. For Buddhists for whom life is so sacred, it is even worse. While I see much wrongdoing in this country, by foreigners and locals alike, this sort of behaviour is to my mind, seriously disgraceful and unacceptable. As many members on here know after the murder across from us we got a dog ( breed unknown). Now she is kept chained at night, for her own safety ( neighbour loves poisoning dogs). Daytime she runs around , she cannot get out, other dogs cannot get in, never makes a mess, goes into the lime tree area to do her business. As i am typing this, she is lying at the side of my wheelchair, follows me around, does exactly as she is told, yet she will not listen/ obey when my wifes speaks to her ( something which i find hilarious ). Now after having her here a few months i would hate to lose her, damn good company for me when my wife is at work. Looking at the video clip, that poor abandoned dog just as faithful/ loving as my dog. Sounds very much like our dog. She is only 15 months old and follows me around everywhere. She loves my wife too, but doesn't obey her. Yes, I also take her in at night as last year our other dog suddenly died of toxic poisoning. Not sure where from though. I haven't watched the video and don't intend to as things like that upset me. Dogs become very loving and faithful and I simply cannot understand that people just dump them. Would they suddenly dump their children? Is there a law which prohibits dumping?? How do they know the dog was dumped? Maybe it was just jumped out the back and they could not see? I cant see anything that susbstantiates the "apparant" dog dumping claim? Yes but never the ones near their own house. "It was apparently dumped by its owners". "One of the women on the motorcycle in the video suggests that the dog was left". From what I can see it is all supposition. Nothing at all there to suggest the drivers of this pickup are the owners of the dog. All they saw was a dog running down the road possibly chasing a specific vehicle. There could be any number of reasons for that happening, indeed you can see dogs running around in the roads all over Thailand. More is the pity it didn't get run over by the pickup before it causes an accident, dogs like that are a danger to road users, particularly motorcyclists. Thanks Kim J for pointing it out as well. More﻿ is the pity it didn't get run over by the pickup before it causes an accident, dogs like ﻿that are a danger to road users, particularly ﻿motorcyclists. Jim J, the dog knew it's masters and it's masters truck. I've seen this cruelty before in Bang Sare. Dog ran for several miles before losing power. Why not take to a center for treatment of deserted dogs? And this one will now become a soi dog which many TV members propose killing. The b******d owners are the ones who should be put down.